The lines and net are the most obvious components of a tennis court. The lines define the area that you must hit the ball within to start and play and ultimately win a point in tennis. Any ball landing outside of the line boundaries is out of play. Any ball within the lines or touching the lines is in play. except for the baseline which can be up to 4 inches wide. It is important to know the line names and areas as other courses will refer to these areas by name. The line at the end of each side of the court is called the baseline. The baseline extends the full length of the court. The baseline is one of the boundary of the area of play. Any ball not bouncing before the baseline is out of play. The baseline must also be stood behind when serving. The baseline is divided in the middle by a center mark, sometimes referred to as the hash mark. The center mark is used as a reference to show servers where the middle of the court is. The center mark is 4 inches long and two inches wide, drawn inside the court and parallel to the sidelines. The singles sidelines run lengthwise, perpendicular to the net and forms the other two sides of the outer boundary of the tennis court when playing singles. 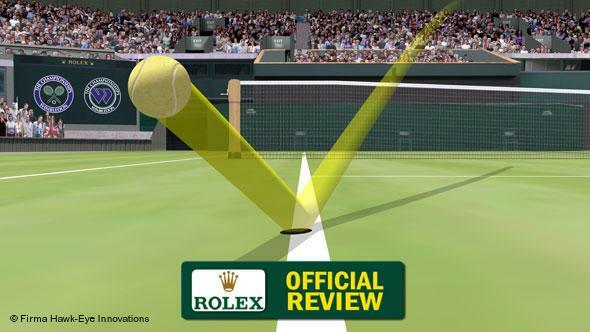 Any ball landing beyond the singles sideline before bouncing is out of play. The singles sideline is also the lengthwise boundary for serves in both singles and doubles. The doubles sideline is exactly the same as the singles sideline except that it is not used for a boundary when serving. The doubles alley is the term used to describe the space in-between the singles side lines and doubles side lines. In singles, or when serving, a ball that lands in this area before bouncing is out of play. The two lines located within the singles sidelines and between the net and baseline running parallel with the net are called the service lines. The service line is similar to the baseline in that it is the boundary for the area of play for a serve. Any serve not bouncing before the service line is out. perpendicular to the net and parallel with the sidelines. The service lines and sidelines join to form the forecourt. This box lies closest to the net. and the “ad,” or advantage court. The sidelines, service lines and baseline create the boundaries of the backcourt. It lies between the service boxes and the baseline.